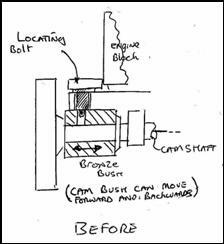 The camshaft bronze bush is prevented from moving due to a small square head bolt, which is located in front of the engine block. 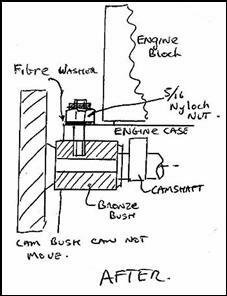 However, when this was new it was not a problem, but after time the hole in the bronze bush and the pin start to wear due to the continual lateral movement of the camshaft timing gear. The bolt starts to leak..... and there is a slight increase in noise from the timing gears. So how to over come this? A good suggestion from Tony Leslie [Holmsdale Sevens] is to replace this bolt and pin arrangement with a stud and lock nut. This is similar to what Austin did on the magneto engine [so why did they change?]. 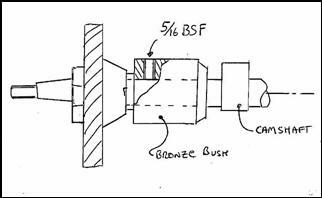 1 x 5/16" BSF tap and suitable tapping drill; 1 x 5/16" dia drill; 1 x 5/16" BSF engine block stud; washer and nut and preferable nylock nut [as it will seal the thread from any possible leakage]. Fibre washer. 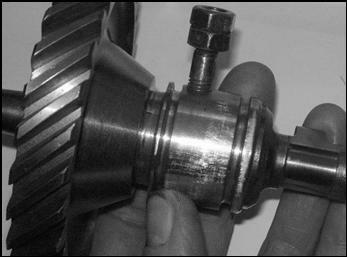 Using a new stud ensure that the tread is cut off, so that when it is screwed into the bronze bush it is unable to touch the cam shaft itself. Fit the camshaft bush as you would normally do, then screw in the stud. This is a little more of a fiddle BUT worth it. Fit the fibre washer, metal washer and then tighten the stud down with the nylock nut. JOB Done ! You may notice from the photograph below of the bronze bush that it has two grooves around the body. Because I am using an up-rated pump I wanted to make sure that no oil escaped between the bush and the aluminium housing. To seal the bush to the housing I have used two ‘O’ rings. The size of the two ‘O’ rings is 1.25"ID X 0.125" Sec, the shore hardness value is 70~75 [quite soft]. No more leaks or movement from the bronze bush. This article, written by Mike Davies, originally appeared in CA7C Seven Focus in Mar 2006 pp16-17.